We are constantly bombarded by so many different diets: paleo, vegan, vegetarian, gluten-free, grain-free, high-fat/low-carb, Atkins, Weight Watchers...the list goes on and on. And if you find one that works for you - you feel better, your skin glows, you have higher energy, etc. - you probably want to “convert” your friends, family, everyone you know to this new “perfect” diet you’ve discovered. But even if they do take up this newfound diet, it doesn’t necessarily mean that it’s going to work for them. I understand that if you find something that works for you, it’s very tempting to want to share that with other people, and well you should, but try not to judge them if they try it and it doesn’t work. It doesn’t mean they’re doing something wrong, only that their bodies have different needs than yours. Just like we all need different amounts of sleep or water or interaction with others, so we all need different quantities and sources of food. There is no perfect diet. Even scientists have a hard time explaining this one; there are any number of studies touting the health benefits of multiple different diets, each study giving you relevant information as to why their study’s diet is the best. It’s no wonder that we find ourselves so confused. I mean, there has to be a “perfect” diet out there for each of us, right? Like I’ve discussed in previous blogs, I think the word “perfect” places a morality on a diet that shouldn’t exist. After all, even if you do find this magical unicorn of a perfect diet, what happens if you stray from it? Does that make you a bad person? Is your body going to fall into disrepair if you don’t follow this diet 100% of the time? I think it’s much more complicated than that. If you think you’re “bad” for not doing something, it’s going to raise your stress levels, leading to higher levels of stress hormones in your body (insulin and cortisol), which causes you to hold onto fat, lose muscle, and slow down digestion. Of course our “perfect” diet isn’t going to work in this situation, even if we only “slip up” once. I suggest an alternative method of thinking. What if our bodies’ needs are constantly shifting? After all, we go from breast milk to mashed up foods to “adult” foods all within the span of a year or so, each shift being the new perfect diet for our growing bodies. This continues throughout our lives. I’ve know vegetarians who have followed that diet for ten years and suddenly need to start eating meat again-their bodies’ needs have shifted . Our upbringings and beliefs can also play a factor in the foods our bodies delight in. For example, if you give two different ethnic groups each other’s diets and then give them their own, you’ll find that they digest and assimilate more efficiently when given the foods they’re used to. Fascinating, huh? Optimizing diets - foods we choose if we are a high-performance athlete, trying to enhance our immunity, etc. In addition to the above-mentioned diets, we also have different needs seasonally. For instance, we’re biologically wired to hold onto more weight during the winter months. If we’re sick, chicken noodle soup might be a fantastic food to help us feel better, but I doubt there are many who would benefit from eating it, and it alone, daily. For women, where we are in our cycles can affect us. You’ve probably noticed a theme throughout my discussions with you: that you should listen to your body. It holds the key to what will nourish you at any given time, and the answer is going to change throughout your lifetime. Choose what works for you. 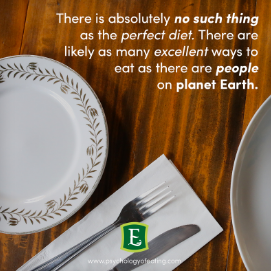 Please don’t get stuck in the notion that you have to find the perfect way to eat before you feel healthy, because there is no perfect way. Thank you for joining me. I look forward to sharing with you again next month about the belief: “If only I looked a certain way, then I’d be happy”. Until then!